FaxOut allows you to send scheduled faxes. This is useful if your recipients are located in different time zones or if you wish to send holiday faxes. This article will guide you in setting up a scheduled fax using your online account. Enter the fax number, or click Contacts to select a recipient from your Contact list. Select a number or a contact name from the list. 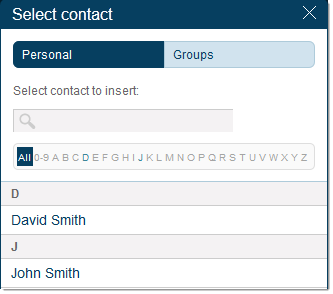 Once you have selected a number or a contact name, click Insert. NOTE: The contact selected will then be added in the To: field. Select your Cover Page from the templates. NOTE: Click Preview to see how your fax will look like when it is sent. Enter a note in the Cover Page Note field if necessary. Click Browse to find the document you want to send and then click Open. NOTE: FaxOut or EmailtoFax supports more than 50 file types, e.g. .jpeg, .pdf, .psd, .doc, and tiff. The recommended size for PDF files (sending and receiving) is 11KB. Total file size must be below 20MB and is less than 200 pages. It is also advisable but not limited to sending more than 50 pages in batches. Click to select Schedule and the Send on: option will appear on the bottom. Select the date and time your fax should be sent and then click Schedule. You have just scheduled sending a fax on your Office@Hand online account.